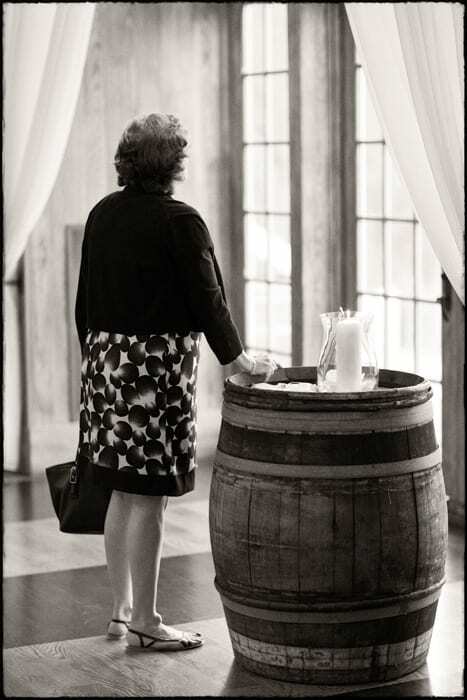 A memorial candle was placed on a wine barrel in front of the guests at the wedding of Lauren and Zach, remembering the groom’s mother. This photograph unfolded in front of me as this lady quietly stepped up to the front, looked at the photograph of Zach’s mother and the memorial candle, put her hand on the barrel, and just looked outside, deep in thought. The beautiful surroundings of Veritas Vineyards and the weather that day made for a wonderful wedding and we could certainly see that a proud mother put her touches on the beauty of the day. I know the bride and groom personally and it was a sincere pleasure to document the day for the two of them.